Happy Earth Day, space fans! 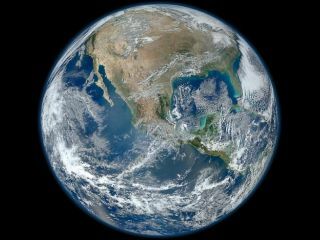 Today marks the annual celebration of our home planet and if you're in the Washington, D.C. area, NASA has a slew of live events planned to highlight what makes Earth so special. NASA also has many online activities available for Earth fans, including its "Global Selfie" campaign to reach out across the social network universe. NASA's Hyperwall displays large visuals that provide new perspectives of Earth's environment, the sun, our solar system, and beyond. All times EDT. Dynamic Planet -- This touchscreen interface allows users to drive a spherical display that shows a variety of remote-sensing satellite datasets. Eyes on the Earth 3D: Come Fly with NASA -- A 3D visualization experience that lets users "fly along" with NASA's fleet of Earth science missions and observe climate data from a global perspective in an immersive, real-time environment. Space Racers -- A new animated television program following young Space Rocket cadets as they soar through the solar system learning about scientific investigation and observation, space exploration, and the importance of working together as a team. Visit the Space Racers Kiosk for an exclusive sneak peak of our new "Space Collector" game. Science Casts -- Short videos about interesting and unusual science topics encountered by NASA's science missions. New episodes every week look into the science behind discoveries on Earth, the solar system, and beyond. Learn more at sciencecasts.nasa.gov. iSat -- The Interactive Satellite Tracker is a browser-based application that allows you to track all NASA science satellite missions, as well as other satellites. Calculate Your Carbon Footprint -- Discover where you fall on the "Green-o-Rometer." We’ll even offer simple tips on ways to reduce your carbon consumption. UV-Detecting Beads -- NASA keeps a close eye on the sun’s ultraviolet (UV) radiation and you can too. Become a UV detective with specially designed UV-sensitive beads and walk away with your own UV-detection bracelet. Learning Remote Sensing with Puzzles --Help NASA piece together images taken of Earth from space, including the popular "Earth at Night" image. Know Your Earth -- How well do you know your home planet? Take a quiz and earn a prize if you correctly answer each question. Through these quizzes, you can learn all about NASA Earth Science. Digital Photo Booth -- Get your face in space and walk away with a real keepsake. Earth Connection via Suborbital Platforms -- Navigate your way through NASA science and explore various research platforms using two touchscreen kiosks. Touch the materials used to make NASA's scientific balloons and inflate a cylinder made of the balloon film to observe how the material behaves while the cylinder expands. The Earth Imagery Challenge -- NASA satellites are taking measurements of planet Earth from space every day. Follow our "clues" to solve the imagery mystery. Sensors, Circuits, and Satellites --Assemble an energy-sensing circuit and discover how NASA's Aura satellite studies the chemistry of our atmosphere. Puzzling Changes in the Land -- Arrange a time series of Landsat images or piece together a Landsat scene to reveal Earth's changing landscape. Aviation and the Environment -- What would happen to us if our atmosphere suddenly disappeared? Learn how pilots and astronauts protect themselves as they travel to the very edge of Earth's atmosphere. Measuring Precipitation:On the Ground and From Space -- Learn how rain gauges work, how the technology of the new Global Precipitation Measurement (GPM) satellite measures precipitation from space, and why it's important to look at precipitation patterns around the globe. For more information about the Union Station event, visit here.